In the past sixty years or so, computers have migrated from room-size megaboxes to desktops to laptops to our pockets. But the real history of machine-assisted human computation (“computer” originally referred to the person, not the machine) goes back even further. 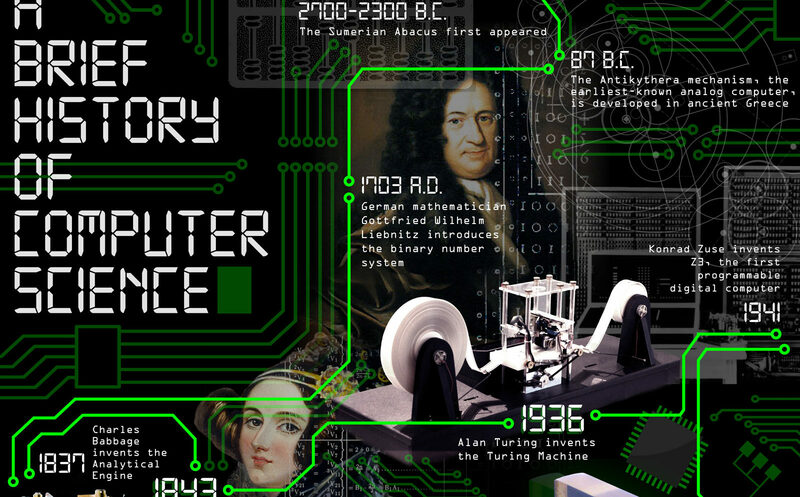 This week is Computer Science Education Week, and to kick things off the World Science Festival celebrates the long history of man’s best friend, the computer. First in the historical record was the abacus, helping the ancient technorati gain an edge over trading partners still counting cows and amphorae by hand. The oldest known complex computing device, called the Antikythera mechanism, dates back to 87 B.C; it’s surmised the Greeks used this gear-operated contraption (found in a shipwreck in the Aegean Sea early in the 20th century, though its significance wasn’t realized until 2006) to calculate astronomical positions and help them navigate through the seas. Computing took another leap in 1843, when English mathematician Ada Lovelace wrote the first computer algorithm, in collaboration with Charles Babbage, who devised a theory of the first programmable computer.